The Cube USB Power Hub is a USB charging station that can charge multiple devices simultaneously via mains. It is small enough to place everywhere, be it on your desk, table or night stand. The Cube USB Power Hub charges up to 5 devices at the same time with a dynamic output of max 8A. 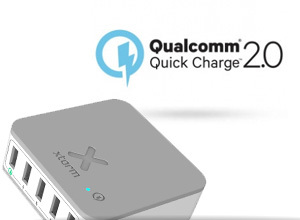 (4x 2.4A output + 1x Qualcomm 2.0 Quick Charge) It sports a special output for your iPad and iPhone for optimum charging results. Suited to charge any USB-powered mobile device, like a tablet, camera or smartphone. The Cube comes complete with an AC power cable, so you can connect it to any power outlet. Easy to use, tidy desk solution in a modern day design. This Xtorm Cube Power Hub is highly efficient and ensures the least possible loss of energy during the charging process. This Xtorm Power Hub is provided with the APM-chip. This means that the Power Hub automatically balances the correct charging speed and efficiently divides the power between the attached devices. The Cube Power Hub has high outputs. This features make it possible to charge the connected device as fast as possible. 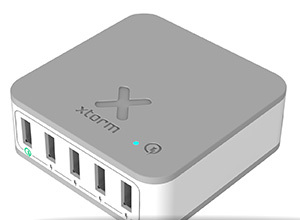 This Xtorm USB charging hub can charge 5 devices simultaneously, using only 1 AC plug. Read more about this Xtorm Power Hub below. We are all familiar with the problem - all the plug sockets in the room are filled with various USB AC adapters for multiple devices. For your camera, your own phone, a tablet, etc. This Xtorm Power Hub solves this problem, 5 USB ports in 1 hub. This Cube Power Hub has a Quick Charge 2.0 port. This port uses a special charging technique, which charges compatible devices to 60% full in just 30 minutes. Please note: Not all devices have this technology, check the documentation for your device carefully to see whether it is QC 2.0 compatible. The Cube Power Hub has a sleek design, based on the successful Xtorm XB Power Bank range, this hub looks perfect on any desk, nightstand, table, etc.